A monocular can be a very handy device to have with you. You can use it for reading signs, looking at a beautiful mountain, bird watching and so much more. You surely need a pair of good monoculars, but what makes them good or suitable for your activity? The first thing you need to look for when deciding on your next purchase is the magnifying power. A typical monocular will usually have a 6 to 10 times magnification, and most of the time, the little gap between 9-10X and 6-7X power makes it for a good difference of money. The second thing you need to look at is the lens size which will inevitably affect the overall monocular size. In general, an 8X25 to 10X25 can be considered a small/regular one and most companies offer a carrying bag for this type. However, if you find yourself using the monocular a lot you will need to consider a bigger one like a 36mm, mainly because small lens cause fatigue. Obviously, last but not least you need to know whether you will be using it during night-time or day-time. The good thing at monoculars is that you can have the same magnifying power as on a binocular, but at roughly half the size. And in most cases, a monocular can be considered a smarter decision. With that in mind let’s proceed to the monoculars themselves which in our opinion are the best your money can buy. 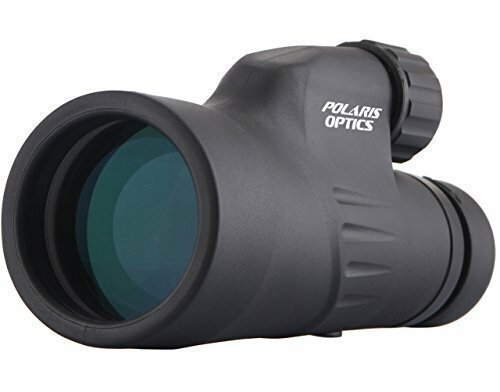 The Polaris monocular delivers great quality at a great price. It comes with lots of features that make it suitable for many activities that require powerful magnification and clear images, all wrapped up in a resistant non-slip rubber armor. It has a 12X magnification which is pretty high considering that most monoculars in this price range offer a maximum of 10X magnification. Staying in the lens register, they are fully multi-coated that increases the light transmission, and it has an objective diameter of 50mm. It features a couple of barrels which are filled with nitrogen gas that stops internal fogging, so it can be considered fog proof. It is as well fully waterproof so you won’t bother if you drop it in water or a rain comes out of nowhere. Other functions include an adjustable eyecup that twists up and down for comfortable visualizing and a close focusing distance of 2.5m. 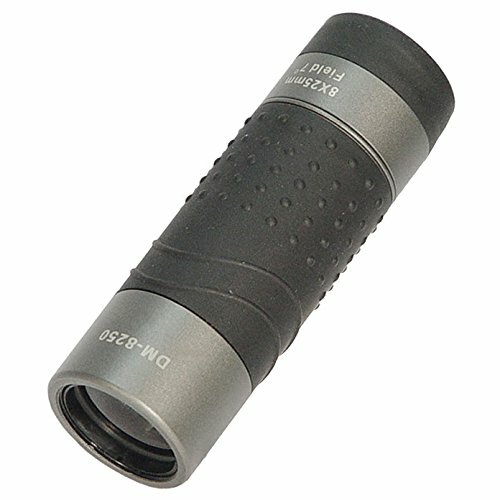 Overall this monocular is a great piece and you will enjoy both its quality and the money that remained in your pocket. Carl Zeiss has been incredibly good at offering high-quality lenses to many devices like video cameras, microscopes etc. roughly every device that requires high-quality optical systems might already use a Zeiss lens. With great quality comes a stiffer price, but it deserves every buck. Here is why. It has high-performance optics that produce bright images and crisp views at 1000+ yards without any problems. The 8X magnification is enough for quite distant views. It has a 26 mm objective diameter along with a 3.25 mm exit pupil and a 17.5 mm eye relief. At 2 width by 4 depth inches and a weight of 11 ounces, it will fit most pockets, and won’t represent a burden to carry around. As a special feature, you get a laser rangefinder technology that lets you measure distances within 1.5 seconds (really, that fast). This means that you can use a narrow measuring field to measure small and moving targets with high precision. Another feature that you won’t find on another monocular is the patented BIS or ballistic information system that helps you quickly and precisely correct the holdover point. The system uses the selected ballistic curve, the distance measurement, and the caliber to find the proper correction which will in most cases increase your hit rate. As speaking of design and feel, the Carl Zeiss Victory PRF is robust, waterproof and dustproof, featuring a rubber armor that gives it both a firm grip and a good protection against shocks. 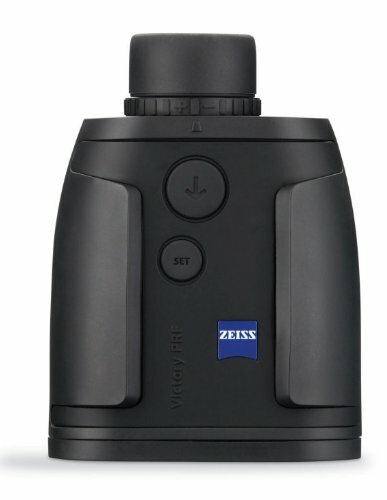 If you want great features incorporated in a quality case, the Carl Zeiss Victory PRF might be a good choice for your next monocular. We encourage you to weigh the pros and cons and decide if this piece fits your needs. Measuring less than 7 inches long, the Orion 10-25X42 is easy to take anywhere so that you can enjoy beautiful landscapes, wildlife, birds, or whatever you may use it for (outdoor use mostly). Speaking of lens it has a big 42mm multi-coated objective lens which provide clear and bright views, the magnification power is a variable focus one and it starts from 10X being capable of reaching 25X. 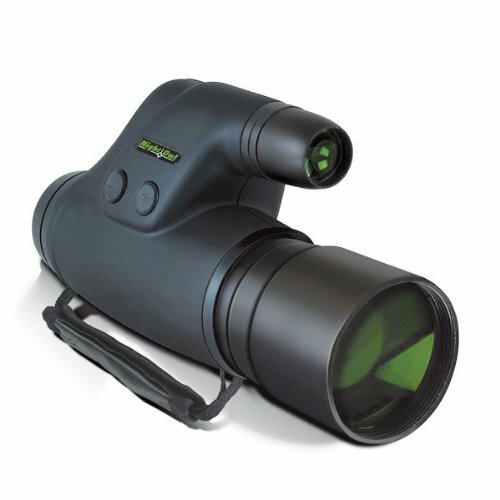 One of its key features that you won’t easily find on a monocular in this price range is the very short near focus distance of just 20 inches, very handy feature if you need to magnify something that otherwise would require a microscope or a magnifying glass. Speaking of feels and construction, the Orion feels pretty good in the hand having a weight of just 12 ounces and a rubber-coated body that protects the zoom monocular from occasional tumbles. At a relatively small price you get a good monocular with great specs, so if you consider that this satisfies your needs, you can hop off the fence and make the buy with confidence. Started in 1986, Vanguard began as a small manufacturing facility that soon became a global corporation that now produces tripods, camera bags, cases, all kind of optics like rifle scopes, spotting scopes and of course, monoculars. The Vanguard DM-8250 is lightweight and compact, and very easy to fit in most pockets, but that doesn’t mean its optics are not good enough. It has an 8X magnifying power, with the objective lens diameter of 25mm, a view angle of 7.0 degrees, and a pretty good near focus of 1.1 foot. The field of view is roughly 367 ft or 1000 yards. The durable metal alloy housing features a rubber armor and it does resist pretty good at shocks and persistent usage, however, it’s not waterproof and it’s not going to resist many falls from face level. If you think this is an important thing for you and mainly want a very resistant monocular, you should consider another one from the list. The eyecup is one of the most important parts on a monocular and frankly the one here is pretty comfortable with a nice peel-down rubber feature. Of course this item has its pros as well as its cons, but if you want a reliable small-sized monocular with a wide view angle and high magnification, the Vanguard DM-8250 might be the one for you. Kenko Tokina Co. Ltd. is a company founded in 1957 that has a great tradition in producing optic systems and photographic accessories. Monoculars is just one branch of their activity, and they are pretty good at it. 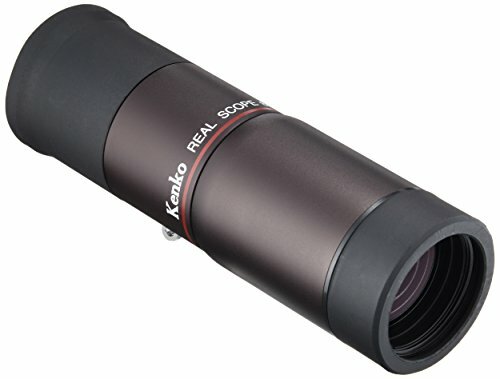 The Kenko Real Scope 8X32 near focus as you might expect from the name, has an 8X magnifying power, a 32mm objective diameter, a 7.8 degrees field of view, a 17mm eye relief and a very good close focus distance of 0.7 meters or 2.30 ft., this will mostly help when you want to take close-ups of certain elements. The lens are fully multi-coated and the focusing mechanism works flawlessly. It is lightweight at only 180g/6.35oz and has small dimensions of 1.60 by 5.30 inches. It is built from metal and it also comes with a soft case with a strap included. So if you want a monocular that you can mostly use at indoor events that offers sharp images and a great build, you can consider the Kenko as your next monocular. This model can be both used as a magnifying glass or a binocular due to its pretty high amplification. 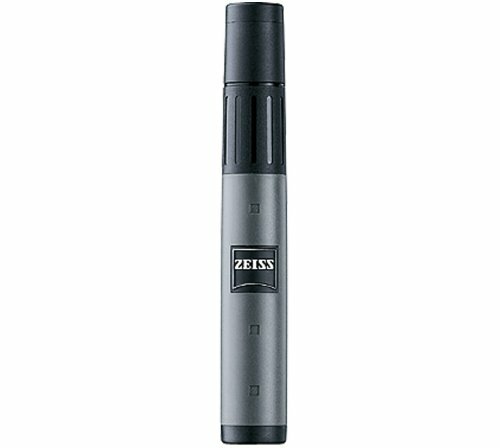 The Carl Zeiss monocular provides remarkably crisp and bright image quality and large fields of view although it is all wrapped up in a miniature format roughly the size of a pen (also includes a pocket clip). It has a 5X magnification, a 16.5 mm eye relief, a 2 mm exit pupil, a 10 mm objective diameter, a 300 ft field of view at 1000 yards, a 13 ft close focus and a +/- 4 diopter range. The lens has a patented T* anti-reflective multi-coating lens that offers high image quality in sunny conditions, and a broad range of temperature on which it is functional, from -4° to 104° Fahrenheit. Considering that this is what the producer guarantees, it will probably work in even colder/hotter temperatures. The housing is made out of a non-slip weatherproof and waterproof material and depending where you buy the monocular from, it comes with some carrying straps, a lens cap and a nice lifetime warranty from Zeiss for the optical components and one year for the carrying strap, lens cover, and the plastic accessories. Don’t expect performances as on a $700+ dollar model but overall it’s a great piece for close-ups and in some cases wide field and distant views at the price. Many people around the globe trust Carl Zeiss and their products, so should you. It’s a great piece and if you consider it has what it takes, you can buy it with confidence. Firefield is a relatively young company. It was founded in 2009 right at the beginning of the crisis which introduced them in the harsh and unpredictable economic environment right from the start. This was however a good thing, mainly for the customers because the company was forced to produce best-buys in order to survive on the market. 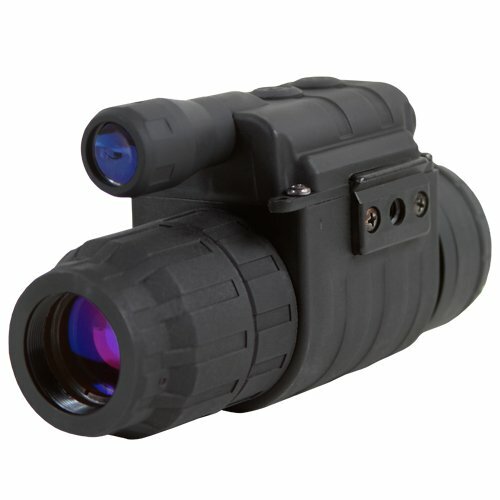 The Firefield 5X50 Nightfall has mainly two strong points: The range of view and the high-resolution images it produces. Featuring an ergonomic design, it comes equipped with a power saving Pulse IR illuminator, and a huge 50 mm lens diameter to help you see at distances as far as 100 yards during night-time without the worry of battery drain. Other features include a high power built-in infrared illumination, a close focusing range and a sweet 3 years warranty from the producer. The casing material is made of rubber, at 15 ounces and 2.38 X 3.75 X 8.13 inches (H X W X D) it won’t be a burden to carry around with you. This monocular can really be considered a best-buy at the price, offering great performance and a quality casing for the money. If you consider it has what you want from a night vision monocular, you can make the purchase with confidence. The Night Owl NOXM50 offers a lot of functions, from high magnification to crisp images and great ergonomics, all at a reasonable price. It features a lens diameter of 50 mm with an angular field of view of 15 degrees, a magnification of 5X, a 200 ft viewing distance, a resolution of 35 lp/mm on center, a minimum focal distance of 5.7 feet, a spectral sensitivity of 400 nm to 900 nm and a fast manual focus. 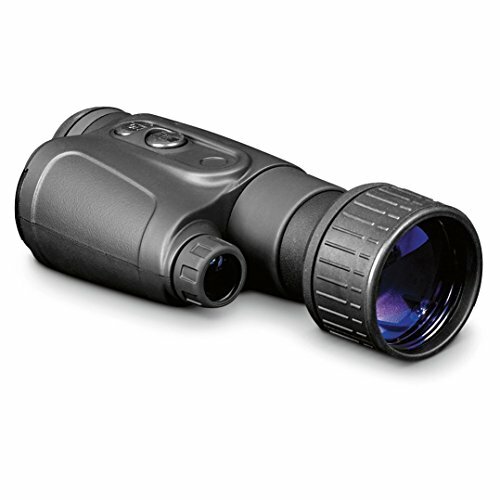 It has a rugged body covered by a protective finish with dimensions of 7.75 X 3.79 X 2.48 inches (L X W X H) and a weight of 16 ounces, which is reasonable for a night vision monocular being however on the heavier side. As power supply, it requires 3-volt type lithium batteries. Obviously, it has an infrared illuminator built-in that lets you use it in complete darkness, but also is useful in improving the target recognition in any environment. If you want a reliable night vision monocular that you can use in complete darkness at far sights this might represent a clever pick. 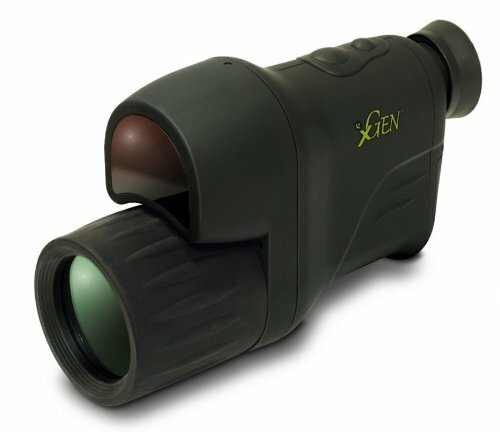 Easy to use, lightweight and with a 3X up to 6X magnification, the Xgen pro 3X Digital Night Vision is a great performer in both far and close focusing ranges. It features superior optics with a 37mm lens, a minimum focusing field of 3 inches and a very handy function that lets you separately control the frame rate and the infrared intensity so you can customize it in accordance with the environment you find yourself in. It is designed to be operated with only one hand so expect a good firm grip and a nice feel of the rubber-like material from which is made of. However, something that you should know before buying this product is that the image through the viewfinder is black and white. In most situations, this shouldn’t be a problem but if you consider this as a drawback you might need to consider another item from the list. The Xgen pro 3X is one of the cheapest products in the night vision family, still, one of the best performers when speaking of far views, close ups and form factor convenience. If you think this item fits your needs, it is a good moment to get your hand on one. 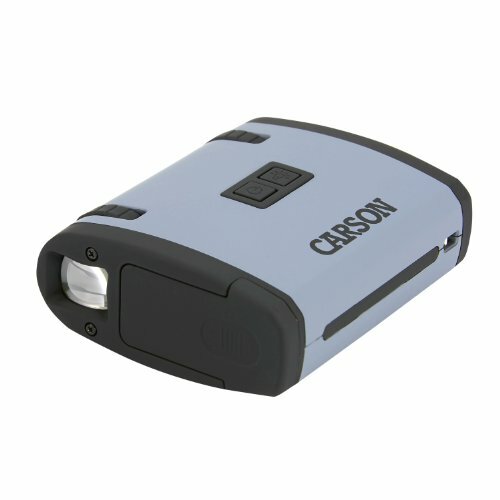 Extremely compact at a weight of only 3.4 ounces and dimensions of 2.6 X 2.2 X 2.2 the Carson MiniAura is an extremely lightweight and compact device and will easily fit most places you’ll want to slip it in. It offers high infrared intensity that can be easily adjusted with the push of a button, a 19-degree angle of view and up to 90 feet of viewing range in total darkness. 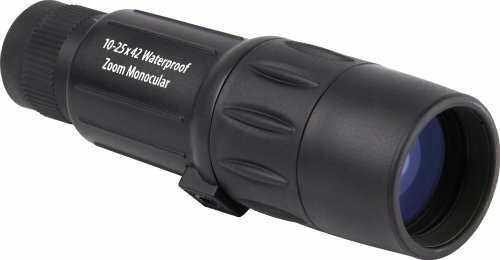 It works with 3 AAA batteries and due to the all digital type of the monocular you can forget those classic intensifier tubes that burn over time and bricks your monocular. It is also a black and white model but the images are crisp and the clarity is astonishing even at an 80 feet distance! You can use it for night-time hunting, spotting owls or night birds as well as sightseeing, wildlife, and admiring beautiful landscapes. Depending where you buy this monocular from you would probably get a carrying pouch and a wrist strap to take it more easily on your trips, and at the price, it is a good pick. Then why not have one? The Sightmark Ghost Hunter 2X24 night vision monocular is a more professional device. It can be used both as a standalone monocular and as a powerful night vision rifle scope, however, you are not limited to these two only. Your imagination is the limit as long as you use it for its purpose. It has a resolution of 36 lines/mm a multi-alkaline photocathode, a field of view of 132 yards, an eye relief of 12 mm, a diopter adjustment of +/- 5, a objective lens diameter of 24mm and a IR Illuminator with a power of 75 MW, all powered up by a pair of 2 AA batteries of 3 volts each. It easily operates in the range of -20C to 40C, it has an IPX3 certification that makes it resistant to small showers or even small particles of sand, however fully submerging it in water might not be a good idea. The body is made out of Glass-filled nylon composite. At a weight of 8.8 ounces and dimensions of 139 X 57 X 74 mm it won’t cause fatigue when used as a rifle scope, neither when simply using it as it is. Sightmark wants to remain a top leading company in producing night vision monoculars so it offers a limited lifetime warranty that will cover up any component or lens failure. The Sightmark Ghost Hunter is a great overall monocular for nigh time and can save you from being blind in a dangerous environment. Whether you want a cheap monocular, or an expensive one, a night vision model or maybe none of these, it’s pretty clear that you have a large variety of monoculars to choose from made by various companies. Some as old as the hills and some founded right in the middle of our contemporary crisis. It is a good moment to decide on your next pair. Prices are low, quality is at high standards, and the range from which you can choose is tremendous. It is just a matter of preference, taste, and specific necessities.